Synthetic peptide corresponding to Human CYP7B1 aa 493-506 (C terminal). Our Abpromise guarantee covers the use of ab19043 in the following tested applications. Brain, testis, ovary, prostate, liver, colon, kidney, and small intestine. Lipid metabolism; bile acid biosynthesis. Defects in CYP7B1 are the cause of spastic paraplegia autosomal recessive type 5A (SPG5A) [MIM:270800]. Spastic paraplegia is a neurodegenerative disorder characterized by a slow, gradual, progressive weakness and spasticity of the lower limbs. Rate of progression and the severity of symptoms are quite variable. Initial symptoms may include difficulty with balance, weakness and stiffness in the legs, muscle spasms, and dragging the toes when walking. In some forms of the disorder, bladder symptoms (such as incontinence) may appear, or the weakness and stiffness may spread to other parts of the body. Defects in CYP7B1 are the cause of congenital bile acid synthesis defect type 3 (CBAS3) [MIM:613812]. Clinical features include severe cholestasis, cirrhosis and liver synthetic failure. Hepatic microsomal oxysterol 7-alpha-hydroxylase activity is undetectable. 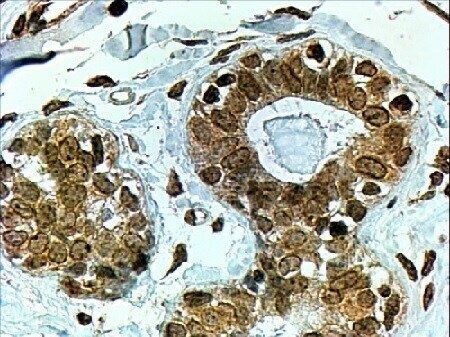 ab19043 at 4µg/ml, staining CYP7B1 in Human Breast tissue sections by Immunohistochemistry (Formalin/PFA-fixed paraffin-embedded sections). Image shows textured cytoplasm staining in ductal epithelial cells. Steamed antigen retrieval with pH 6 citrate buffer was performed, and HRP-staining was used. Publishing research using ab19043? Please let us know so that we can cite the reference in this datasheet. There are currently no Customer reviews or Questions for ab19043.